I have stayed away from news and politics for almost two weeks now as we were dealing with Krishnan’s health scare… So yesterday when I blogged about the Kalamkari saree, I didn’t know about Manohar Parrikar’s passing away. When the news item popped up, we felt really sad. A good man had gone too soon. The first time I heard of Manohar Parrikar was when he proposed Mr. Modi’s name as the PM candidate in 2013. Till then Goa and its politics had not been on my radar so I never knew Mr. Parrikar. The first anecdote that I read about him was how he reprimanded a young man on a bike for not wearing his helmet. The young man apparently didn’t recognise him and said – “my father is the commissioner, who are you?”… the young man must be from Delhi :). Mr. Parrikar removed his helmet and told the young man that he was the Chief Minister of Goa !!! Then I read about how he had managed the vehicle traffic during the film festival in Panaji. The picture that was etched in my mind was of course of the CM of a state holding his gift and standing in line to wish the bride and groom at a wedding …. something was totally right about him. In a country where even the Chief Minister’s gate keeper looks down on the common man, here was a Chief Minister himself being totally a common man. So rare and so heartwarming. When Mr. Parrikar became the Defence Minister, I celebrated because I thought the gap left by the best Defence Minister of India, late George Fernandes was being filled by another man made in the same mould. Unfortunately certain forces within the central government didn’t let Mr. Parrikar flourish and the Goa state election results also pulled him back to his home state. Then the Pancreatic cancer took over ….. till it consumed him. Om Shanthi Manohar Parrikar – they don’t make men like you often. Thanks for the years of service to our nation and your home state Goa… the combination of integrity and tremendous competence in politics is so rare, and you were the poster boy for that. Thank you for that. Return soon to your motherland sans illness and full of energy to serve her again. You will be missed Mr.Parrikar. 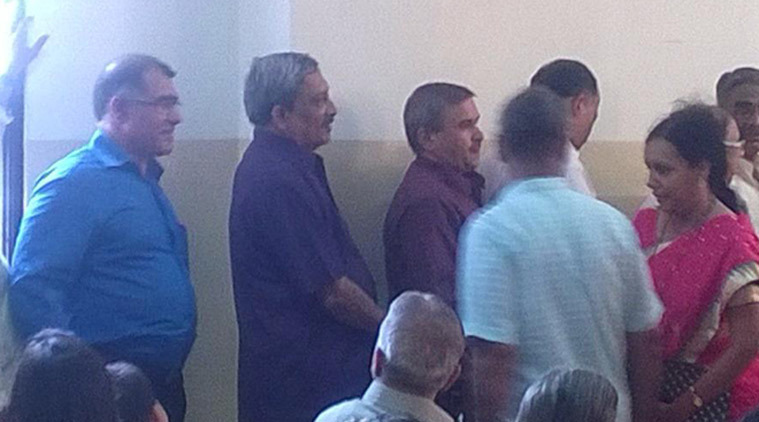 The ex-Defence Minister standing in a queue like the common man !!! What an excellent tribute to a man who truly deserves it. He was truly a politician par excellence .